Greetings to you all, we are happy to give the above report after 7days distribution trip in the Southern part of Tanzania. We thank God all the travels we had were safe. Walter joined Tanzania Team on the 30th Jan in Arusha from Nairobi, it's a 6hr journey by bus from Nairobi Kenya to Arusha Tanzania. There after we started off our trip on the 1st Feb 2017, we travelled to Dar es Salaam, from 8.37am to 9.32pm. We had a safe night in Dar es Salaam then on the 2nd we took off to Matumbi Land (Njia Nne area) in Lindi region. At Njia Nne area we were received by Pastor Daudi Katogoro of TAG church, he was also our host, since it's a Muslim dominated region, everything was planned not to raise any alarm in the area, he took us to an hotel named after the Majimaji war which was a led by a witch doctor Kinjeketile during the fight for independence in Tanzania. This was a Muslim hotel and this scared us more, but we prayed and God took care of us, none of us was attacked even though it had many challenges which were beyond our control. 3rd Feb, was marked for the Matumbi distribution. Everything was arranged and activities started by 10.37am. We gave the sermon, Mark 8:1-21, basically to encourage everyone who was present and to have the sense of acknowledging Christ. In the congregation, we had 2 Muslim ladies who accepted the invitation and were with us till the end of the day's activities, they were scared but in the process, they became lively and sung with us an action that made us to give them Good News booklets each and the CDs which we believed will evangelize to them and that they will accept Christ. They are Matumbi speaking ladies and they too promise to finish and get more books from the pastor later on. 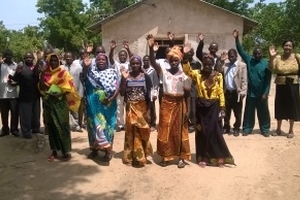 We asked Pastor Daudi to follow-up with them. We need to continue praying for Pastor Daudi Katogoro to have the Lords protection and favor to evangelize to these two Muslim ladies to accept Christ among the others who the Lord will bring forth. Pastors, evangelists, church leaders and congregation responded positively to the invitation and turned up in good number, in spite of the hostility experienced from Muslim community within this area, we all praised God for the attendance including the 2 Muslim ladies who were with us. Here there are different church denominations I.e. Anglican, Catholic, these two aren't common, but Tanzania Assemblies of God (TAG) are majority in this Christian community, at least 2 catholic and 3 Anglican, and 5 TAG churches were represented. Pray with us that the materials we presented to them will be able to help telling the story of Christ and evangelize to many souls to accept Christ and be strong in the Lord. 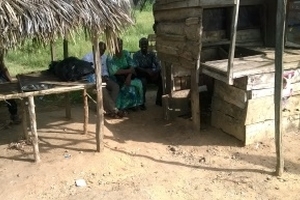 This region is generally poor and any visitor in the area is expected to give, financial help. This forced us to reimburse the pastors travel costs and even appreciate those who help us to bring the day to a successful end, this was the only way to encourage and show them the true love of Christ and that to make them have the motivation to use the materials to help GRN achieve their goal to reach the unreached. After the GRN material introduction everyone felt missing the materials and the pastors and everyone present was very enthusiastic to listen to the recordings as well as seeing the pictures. 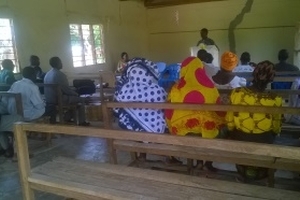 They accepted and appreciated how the materials were well organized with clear recordings in Matumbi, and that these gospel teachings were very timely to the area," you were surely guided by the Holy spirit to visit us" as one of the pastors said during his thanks giving remarks. Please see the pictures and every photo has explanation underneath. On the 3rd Feb 2017, at 4.31pm, we took the bus to Mtwara region from Njia Nne and reached by 9.37pm. We had to spend the night in Mtwara town since there was no means that could take us to the Tandahima area. This area too is Muslim dominated area and we kept praying against the Muslim attacks that were common in this area especially if they realized that you are a visitor and worst of all Christian missionary as it has been in the past. We thank God that we had a smooth mission without having any challenge with them. On the 4th Feb at around 9.30am we managed to get the common transport bus. 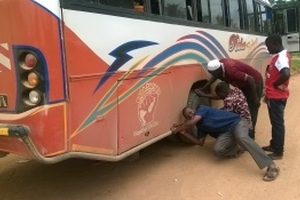 We took off and on the way, it broke down at Nanyamba area, here every one of us were a bit scared in terms being on the rough road and the long distance that was remaining about 103km away and worried to delay to the venue. Glory to God after about 40 min the bus got repaired and we arrived at the venue at 1.45 pm. It was the farming season so everyone was still busy in their farms including the hosting Rev Alexi Namahochi who gave us the final direction to the church and we had to wait for him to prepare. By God's grace the invited guests and few congregations came. Guests were pastor from Lutheran Church and the host Rev Alexi of Anglican Church in the area among the other church leaders. The occasion was well arranged and we pray that God will use them to reach many other people through the use of the GRN materials donated and distributed to them freely, we continue to pray that even the Muslim in the area will be consumed in Christianity in the area and that they will be Christians. We were able to give a sermon from Gen 1:28 and John 4:1f and explain to them our mission and goal for the visit. 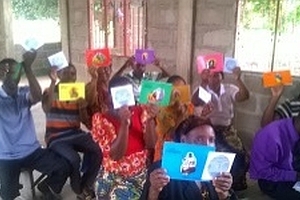 This was received delightfully by everyone and the pastors said they wished they knew us before, because the materials were easy to use, messages were straight and easy to understand even by the old in all setups in their villages; people were very happy to have the GRN materials in their own mother-tongue. They long for more recordings of the rest of their local neighboring language groups (Makua, Ngindo and Yao). Pray with them as they think on how they will support GRN to record these 3 extra languages in the area. Materials were good bible teaching aid with very clear audio recordings in their mother-tongue and this really attracted their attention and said," finally we found our own" Glory to God all these happened by the Lord's favor. We pray with them that they will get the breakthrough in worshiping and multiplying Christianity in the area to cover lager region or assimilate all the Muslims in the area to be Christians. We finished the distribution by 5pm and spend the night in Tandahimba, then took off on the 5th by 6am to Dar es Salaam where we reached at 3.37pm. Everyone was very tired after the rough trip and decided to take a days off and write the report before the journey back to Arusha on the 7th Feb and reaching around 8.30pm. Walter going back to Nairobi Kenya on the 9th after further training Beatrice on the QuickBooks. We are very grateful to the GRN office for sending us to be the ambassadors of Christ on their behalf. The mission was very successful by the Lord's grace. Let's all pray that the work of distribution that we have done will be helpful to these people and by extension to their society as well. May they have the favor of the Lord to enjoy using and be changed by the WORD to love Christ more. We also thank the Lord for the donations and finances that were received and made us go all these distances to present the WORD to these unreached and isolated Makonde and Matumbi groups. Glory be to God.